I pretty much wrote this week off after several evenings out kept me from my work. That and I've still been playing too many video games. I have a feeling it's going to be like this until next year as Christmas rolls in. Speaking of which, I'd better find some presents for people. 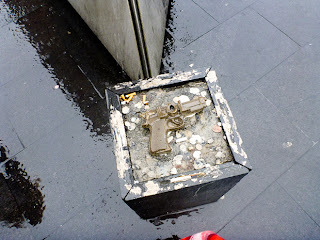 Guns on our streets. Lol. Does it fire lulz? How would you reload a lulz gun? I actually considered joining a shooting club as something that would be out of the ordinary, but I have enough expensive hobbies as it is. A gun that could fill people with laughter would be infinitely more useful. What about all this rain? 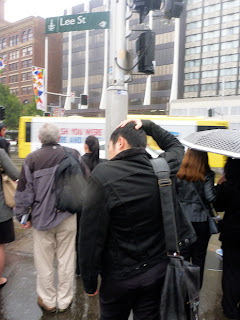 It seems I wasn't the only one caught out without an umbrella this week. I'd like to some day take my DSLR out in the rain and shoot street. You see, most people aren't going to stop you when it's pouring and they're trying to get out of the rain. And there's some quite odd things to see. Take this fellow for example. I have no idea how this works, but he'd been doing it for a while, wandering around, not in any sort of rush, with his hand on his head. I haven't been minding the rain too much for this reason. There's always a lot of interesting things to see. 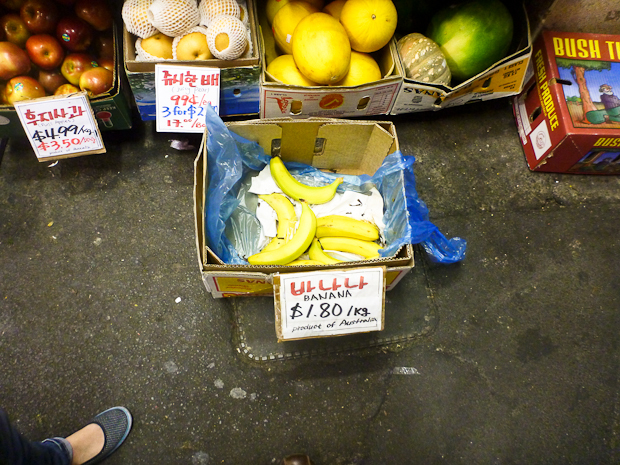 I ended up in Lidcombe this week and one of the places I stopped in at was a Korean grocery store. Why? Ice cream. I don't understand any of it except the English written "please", but I assume it's asking me not to leave the freezer open. Or eat all of their ice cream. Or take photos or something. I'm sure I've mentioned this before, but I love Korean ice cream. 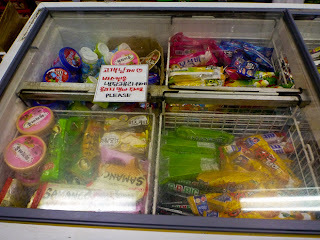 I'm not a huge fan of Melona, the green ones in this pic, but I like the "e-Chocolate Bars" in the blue packaging. Apparently it stands for enriched chocolate ice cream bar. I'd tell you where this shop was, only I have no idea where I was at the time. 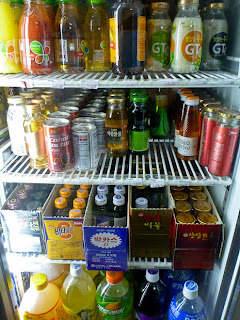 A close near-second are Asian drinks. Who else would sell "Alcohol Doctor" hangover tea? Or a Power of Energy drink? I have no idea what else is in this fridge. I ended up getting something that looked like a half-can of orange-flavoured something-or-other. I figured it'd be like Fanta, but when I opened it it wasn't carbonated and instead contained orange pulp and sweet orange juice. I bet one day I'll buy a coffee based on the picture of coffee beans on it, but instead find it is actually just full of coffee beans. Remember my infatuation with bananas? I'd been waiting for them to come down in price and refusing to buy them any sooner than what I thought was fair. The only problem is, I've gone so long without them and feel so spiteful towards Coles and Woolies/Safeway for jacking up the prices (and I believe they went up way before and after stock would have been affected/been restored) that I haven't been buying many. I have been a lot less festive this year. Normally we have our lights up around November and the tree shortly after. In fact, our lights have been up for the past two years, just never switched on. Well, they don't seem to be working correctly this year and we're still debating where we'd put the tree. We currently have a giant cat tree in our living room for our cat, where our Christmas tree usually goes. 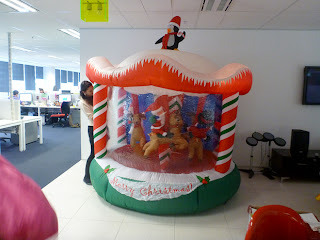 But in a way, I don't feel so bad when we have this Christmas carousel at work. This thing actually moves. I spent a little while trying to figure out if it was at all possible to get inside and dance amongst the reindeer, but it doesn't seem possible. I've taken to prancing around outside of it when I think no one is looking. 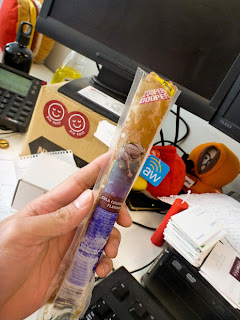 I haven't had a Zooper Dooper in years. When I was in the first grade or so, my primary school used to have tokens that kids were given for good behaviour. These could then be exchanged at the school canteen for a Zooper Dooper. The first time I ever got one I was super excited (excited is something I generally don't appear to be these days, at least outwardly) and ran to the canteen during recess. I was clutching it in my hand as I ran across the playground as fast as I could with the other kids who had one, but when it came my turn to give up my token, it suddenly wasn't in my hand anymore. I never did find out what happened to it, or forget the moment of panic I felt when I realised I'd lost something important to me. After seeing me lost for words and on the verge of bursting into tears, the canteen lady spoke for me. "Did you lose your token, dear?" The only thing I could do was nod while still looking around, wondering how it could have impossibly disappeared. 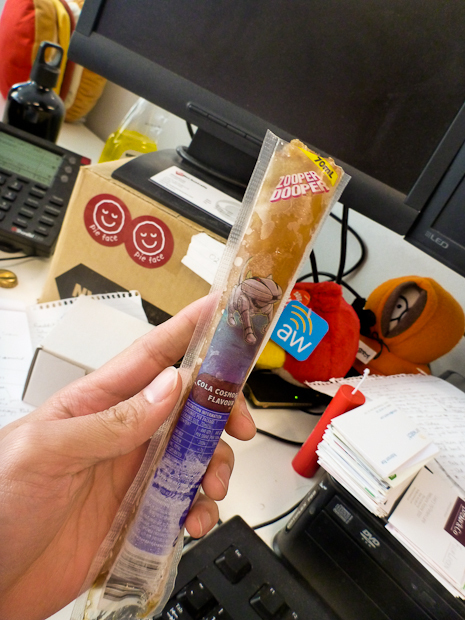 She handed me a Zooper Dooper after snipping the top off with a pair of scissors and reassured me it was okay before sending me on my way. I still don't recall the taste of it, but I've always remembered the mix of emotions at the time. It was probably my first lesson in life of significant (to me at the time) material loss, but more importantly, that sometimes people will give you the benefit of the doubt, even when they're within their full right not to.